In December 2017, Transnet SOC Ltd ordered seven Liebherr Reachstacker LRS 545 for its container terminal in Durban, South Africa. The machines were dispatched from the manufacturing site in Sunderland, Great Britain, in February and thanks to the professional on-site assembly by qualified Liebherr service engineers in Durban, all seven units were put into operation already in March 2018. Now, following 6 months of operating, Transnet appears impressed by the overall performance of the new Liebherr machines, which have proven to be highly reliable as they have been in permanent 24/7 operation after the commissioning. Besides, the Liebherr service station conveniently located in Durban allowed Transnet’s operators, technicians and service staff to have a first-class onsite training for the seven new LRS 545. 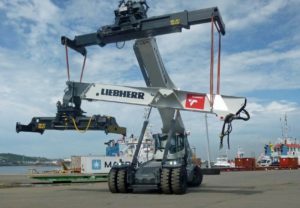 “Overall, we are highly satisfied with the reachstacker LRS 545 and the service provided by Liebherr and would definitely recommend this model as a proper purchase for each container terminal,” said Thubelihle. In general, Liebherr offers a comprehensive service network that guarantees fast response times all over the world, is available 24 hours a day and convinces with the unique availability of urgently needed spare parts. Liebherr has released a short video depicting the process of delivering and commissioning the seven LRS 545 machines to the Durban terminal. We are sharing it with pleasure.